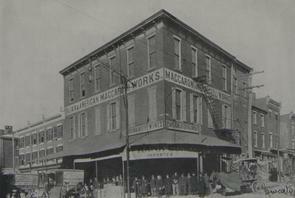 In 1864, businessman Agostino Lagomarsino opened a macaroni factory with his nephew, Frank Cuneo. Originally called the Europa Farina Mills, it was the first major macaroni factory in the United States. 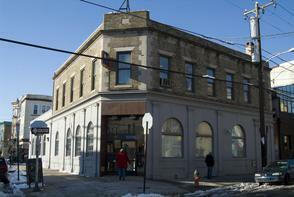 By 1872, the mill was thriving, selling pasta, wine, liquor, and other domestic and imported goods. Both uncle and nephew had emigrated separately from Genoa, Italy. As some of the earliest Italian-immigrant entrepreneurs in South Philadelphia, Lagomarsino and Cuneo grew quite wealthy and became prominent leaders of their community. They founded and presided over Italian-American fraternal societies and played increasingly influential roles in the local Republican Party. 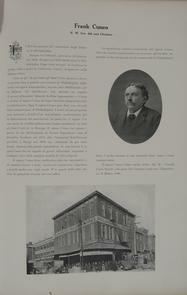 In 1882, Lagomarsino sold his share in the mill to concentrate on his civic and political activities. Cuneo and his wife, Felicitá, continued to grow the business under the name Frank Cuneo Macaroni and Vermicelli Works. The Cuneos' pasta enjoyed a solid reputation in both America and Europe, and they even had a macaroni works exhibit at the 1876 Centennial Exposition in Fairmount Park. Felicitá, by many accounts the business mind behind the operation, died a few months after a freak accident at the factory when her hair got caught in the machinery. Despite this and other family tragedies, Cuneo and his sons continued to ascend the social and political ladders of establishment Philadelphia. Frank Cuneo was considered sufficiently "American" to merit an entry in Philadelphia's Blue Book in 1892 — one of the only Italians to do so — and was an esteemed member of the Philadelphia Commercial Exchange. After Frank's death in 1919, the younger Cuneos continued to serve as political and civic leaders in South Philadelphia.